American White Pelican, Grant County. Photo by Joe Higbee. American white pelicans breed primarily on isolated islands in freshwater lakes and rivers, and forage in shallow areas of inland marshes, lakes, and rivers (Figure 1). White pelicans are known for their cooperative foraging in coordinated swimming groups that encircle fish (Evans and Knopf 1993). Unlike brown pelicans, they do not dive. White pelicans were persecuted in the past because they were seen as competitors for fish, even though studies clearly showed that they seldom preyed on the same fish sought by people. Nevertheless, people shot pelicans, clubbed young, and broke eggs. American white pelicans feed largely on nongame or "rough" fish, amphibians, and crustaceans (Evans and Knopf 1993); many of these are small schooling fish, but larger bottom fish, salamanders, and crayfish are also eaten. Foraging for small fish occurs in shallow (less than 8 ft) marshes, rivers, and lake margins in summer, and shallow coastal marine waters in winter. Foraging areas can be 30 miles or more from breeding colonies. The pelicans nesting at the colony in Washington are not consuming large numbers of juvenile salmonids, based on the relatively small numbers of smolt PIT tags detected on the colony (Roby and Collis 2012). Non-breeding white pelicans on the Columbia and Snake rivers are sometimes observed foraging below hydroelectric dams and may be foraging on out-migrating juvenile salmonids, but their impact on salmonid smolts is not well understood. Rangewide population trend. The total population of breeding adult white pelicans was estimated to be about 30,000 in 1933, but surveys in Canada were believed incomplete (Keith 2005). The number of known breeding colonies increased from 43 in the 1960s, to 55 in 1980, while breeding adults tallied appeared to increase from 63,000 to 109,000 (Keith 2005). The increase was likely partly an artifact of more complete surveys. King and Anderson (2005) reported that the North American population of white pelicans doubled between about 1980 and 2000. They estimated that breeding birds totaled about 134,000 for 1998-2001. 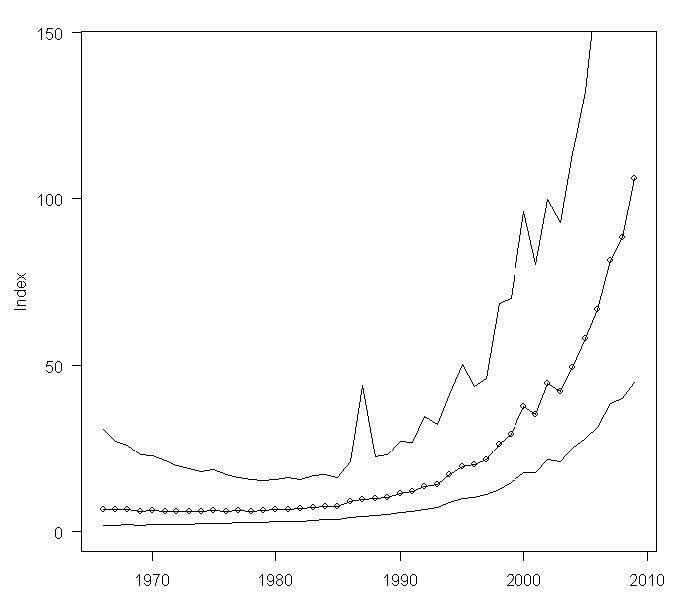 More recent Breeding Bird Survey data for the United States, the most reliable dataset, indicated an annual increase of about 6.6% between 1966-2009 (Figure 2; Sauer et al 2011). The western population of pelicans, which includes all pelicans known to breed west of the continental divide and the pelicans within the colonies at Yellowstone National Park, Wyoming and Canyon Ferry Lake and Arod Lake, Montana, includes 19 breeding colonies in 8 States and British Columbia (Pacific Flyway Council 2012). Based on the most recent data, the western population of white pelicans is estimated at 45,996 breeding adults. Washington population status. Historically, American white pelicans occurred and likely bred in eastern Washington on inland waters such as Sprague and Moses Lakes (Dawson and Bowles 1909 Jewett et al. 1953). The first published record of nesting is from 1926 at Moses Lake, Grant County, a colony that was occupied for several years. From 1926 through 1994 there were no published records of American white pelicans breeding in Washington and it is not clear when or if they continued to nest (Ackerman 1994). In 1994, a breeding colony was established on Crescent Island, which was constructed for nesting birds in the Columbia River, Walla Walla County in 1985 (Ackerman 1994, 1997). In 1997, pelicans began nesting on nearby Badger Island, which is a part of McNary National Wildlife Refuge. Since that time, the colony has grown to over 1,000 breeding pairs and there is little use of Crescent Island. A mean of 2,083 adult white pelicans were counted in the aerial photos in May 2012, down from 2,228 in 2011 (Figure 3; Roby and Collis 2012). The first nesting record of white pelicans in the Columbia River estuary occurred at Miller Sands Spit, Oregon, in 2010. In July 2011, an on-colony survey on Miller Sands, Oregon, indicated a colony size of about 97 breeding pairs (Roby and Collis 2011). In July 2012, an aerial survey counted 427 adults and 79 chicks, and 71 were later banded with alpha-numeric legbands (http://www.birdresearchnw.org ). In September, the nesting area on Miller Sands was covered with dredged material by the Army Corp of Engineers, so it is uncertain where they will nest in 2014. 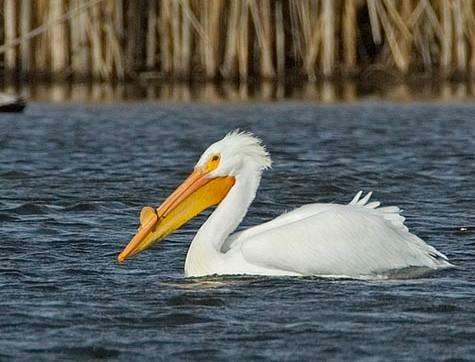 White pelicans also nested in significant numbers at Malheur Lake, Oregon, in 2012 for the first time in many years. Inland waters of eastern Washington also support significant numbers of non-breeding white pelicans year-round, especially along the Columbia River from The Dalles to Chief Joseph Pool. Numbers of these pelicans vary greatly during the summer, with peaks of up to 2,000 birds observed in the Potholes region of the Columbia Basin during late summer. Wintering concentrations, ranging from 40-300 birds, occur along the Columbia River from the mouth of the Walla Walla River to Priest Rapids. Parts of eastern Washington may be important in sustaining non-breeding summer residents and birds that have dispersed from breeding grounds in adjacent states and provinces. Aerial surveys conducted in May 2006 detected up to 513 pelicans along the Columbia and Snake rivers. wetlands in the arid West are affected by insecticides, fertilizers, and other agricultural pollutants. White pelicans have died of poisoning from endrin, dieldrin, and toxaphene, but not from DDT or its breakdown products (Keith 2005). Large die-offs of pelicans in recent decades have been linked to toxaphene poisoning, an insecticide carried into marshes in waste irrigation water. Residues of DDE, a breakdown product of the DDT, remain in sediments. It is not known if white pelicans suffered negative effects on reproduction as did the brown pelicans which suffered from eggshell thinning. About 8,000 white pelicans died of botulism at Salton Sea, California in 1996 (Keith 2005). Water diversion and draining of wetlands for agriculture, along with recreational boating, have destroyed or degraded many traditional feeding, breeding, and loafing areas. Water level fluctuations can flood nesting colonies or expose a land bridge to nesting islands allowing access by predators such as coyotes and red foxes. White pelicans are highly sensitive to human disturbance in nesting colonies, particularly during courtship and early incubation, which cause desertions (Evans and Knopf 1993). The Pacific Flyway Council (2012) developed a framework for managing American white pelicans in the Pacific Flyway. Guidance was needed for agencies and locations dealing with pelican predation on fish of conservation concern, such as Yellowstone cutthroat trout in southern Idaho, Lahontan cutthroat in Nevada, and Eagle Lake Rainbows and federally listed suckers in California. Partners and cooperators: Bird Research Northwest (Oregon State University, USGS, and Real Time Research, Inc), Yakama Nation, USFWS-McNary NWR. Ackerman, S. M. 1994. American white pelicans nest successfully at Crescent Island, Washington. Washington Birds 3:44-49. Ackerman, S. M. 1997. Update: American white pelican colony. WOSNews 51, October/November. Washington Ornithological Society. Dawson, W. L., and J. H. Bowles. 1909. The birds of Washington. Volume II. Occidental Publishing Company, Seattle, Washington. Evans, R. M., and F. L. Knopf. 1993. American white pelican (Pelecanus erythrorhynchos). No. 57 in A. Poole and F. Gill, editors. The Birds of North America. Academy of National Science and American Ornithologists Union, Philadelphia, Pennsylvania. Keith, J. O. 2005. An overview of the American White Pelican. Waterbirds 28 (Special Publication 1): 9-17. King, D. T., and D.W. Anderson. 2005. 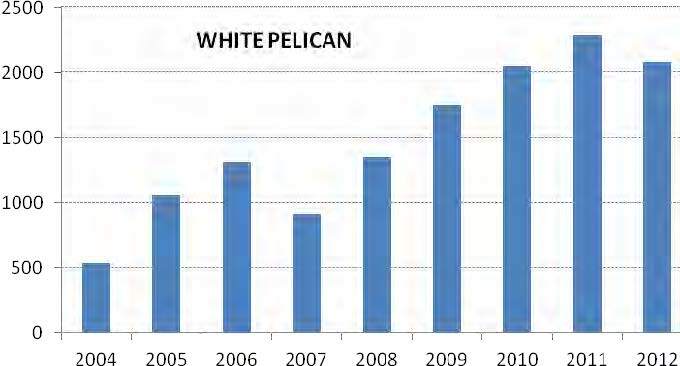 Recent Population Status of the American White Pelican: A Continental Perspective. Waterbirds 28 (Special Publication 1): 48-54. Pacific Flyway Council. 2012. Pacific Flyway Plan: A Framework for the Management of American White Pelican Depredation on Fish Resources in the Pacific Flyway. Pacific Flyway Council, U.S. Fish and Wildlife Service, Portland, Oregon. 49 pp.